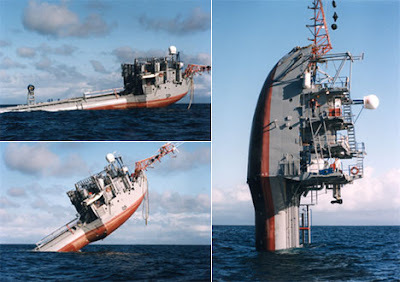 This amazing flipping ship ( officially called as FLIP = FL oating I nstrument P latform) is owned by US Navy and is able to to flip from being horizontal to vertical. As the ship flips, all the stuff gets aligned in the new position to the slightest detail even a ketchup bottle. The project started in 1962 and it is celebrating its 50th birthday. FLIP is designed to study wave height, acoustic signals, water temperature and density, and for the collection of meteorological data. Watch this awesome BBC Video clip about it or Read more at Wikipedia.